Root Canal Failure Symptoms - How Can Root Canal Treatment Fail? And what can be done to save a failed root canal? Root canal failure is always disappointing. A failed root canal means the dentist will be upset, because he has spent a lot of time and intense concentration on doing the root canal. And of course the patient will be disappointed, because they have spent a lot of money on the procedure, as well as sitting in the dentists' chair for a couple of hours. But what exactly IS root canal failure? Is the dentist always to blame? Of course not. Not always. But sometimes. Lets take a look at how root canals can fail, and whether it could be prevented. You have a root canal failure when a tooth that has had root canal needs MORE treatment of some sort. WHY would it need more treatment? BECAUSE there's a problem - nearly always, it's pain or discomfort when biting on the tooth. How can a tooth hurt when it's had root canal, and there's no nerve in the tooth? SIMPLE - the tooth has become infected. Somewhere, somehow bacteria have got inside the root canal system of the tooth and set up an infection. SO it's sore, painful, and you need something doing about it. The options are limited, depending on what is causing the pain. BUT what are the complications with root canal that make failure a possibility? Let's start right at the beginning, from the dentist's point of view. What does he have to do to get the highest chance of a successful root treatment? First off, before he even starts the root treatment, the dentist has to get the right tooth. It seems obvious, and usually it's clear enough, but not always. At times, it can be very difficult to judge which of two or three neighboring teeth is the cause of the toothache. When several teeth all react to a dentist's tests, there's very little to tell him which tooth is at fault. BUT when someone is in severe pain, the dentist can't just send them home and tell them to call back when they can tell which tooth to get treated. He has to take his best shot. Very rarely, it's possible for the dentist to start treatment on the wrong tooth. This will become obvious only later on when the numbness wears off, and you still have the same pain as before. To correct this situation, the dentist should start treatment on the right tooth, and then later complete the root canal on the one he started first. Second, the dentist has to find the little space inside the middle of the tooth. Again, it sounds easy, but when you're the one holding the drill, you want to be sure you're drilling in the right direction! Occasionally, if a tooth is tilted or twisted a little, it is possible (although rare) to drill out of the side of the tooth. This is more difficult to fix. If the dentist realizes his error quickly, the perforation can usually be repaired with a special cement called MTA. Third, assuming the dentist has got the right tooth and has located the little space down inside it, he needs to clean it out thoroughly. He needs to find ALL the little spaces, and he needs to make sure they are completely cleaned out. If he doesn't, bacteria can get in there and set up an infection. This is probably the most common cause of root canal failure. Not finding all the canals, and not cleaning them enough. It's easy to miss one of the canals, and it's difficult to make sure the ones that ARE detected are completely cleaned out. It takes a lot of time, and intense concentration on the part of the dentist. He can't hurry things. 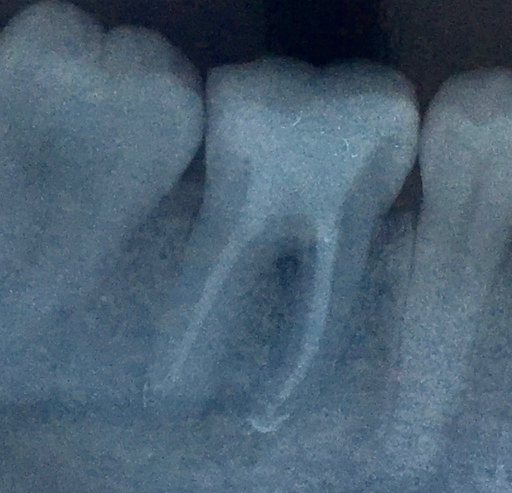 The image above shows a molar tooth with SEVEN tiny root canals. Fourth, once the dentist HAS located all of the canals and cleaned them thoroughly, he has to seal them up to prevent bacteria getting in. This is a little easier than the cleaning step, but there is still plenty of room for error! 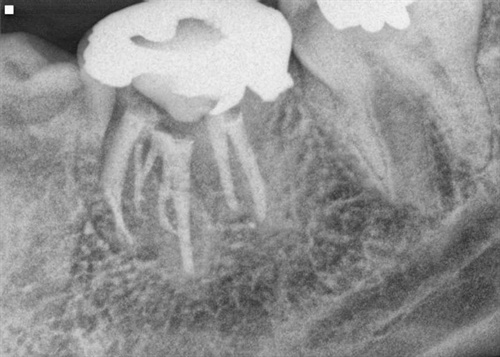 This is probably the second-most common cause of a failed root canal. Not getting a good seal, all the way to the tip of the root. The fifth step is getting a good seal over the top of the root filling. Again, this is to prevent bacteria getting in. On a molar tooth, this frequently means getting a crown (a cap) over the tooth. On a front tooth, a carefully sealed tooth-coloured filling is usually enough. How do you know a root canal has failed? The tooth becomes uncomfortable to put pressure on. You can't bite on it properly. If the dentist has missed a root canal, you might feel pain on hot food or drinks. The only solution is to do the root canal over again. That means removing all the root filling material, searching for any tiny canals that were missed first time around, disinfecting all the canals, and probably putting in a temporary filling material such as calcium hydroxide paste. This might be left in the tooth for several weeks, to make sure the tooth has settled down. ONLY THEN can the new root filling be done. If the first treatment was very difficult, owing to Root Canal Complications, your dentist will probably refer you to a specialist. (An endodontist). There are times when the root canal is doomed to failure, no matter what the dentist does. The two most common situations are if the root itself is cracked or broken, OR if the tooth is so badly broken down that it's impossible to get a good filling or cap over the top. Unfortunately, the only solution is to remove the tooth. 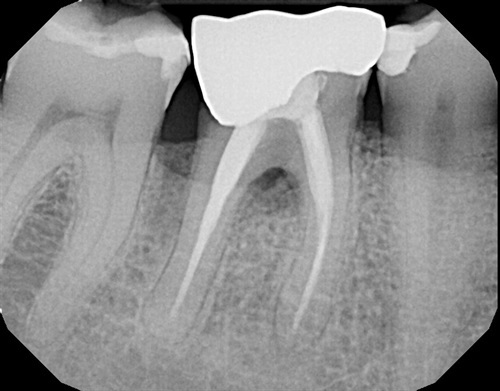 The image above shows a molar tooth with root canal filling - and a dark area between the roots: it's cracked. A cracked root means that bacteria can get into the crack and breed, setting up an infection. There's no way to treat a crack like this. It's not really a root canal failure, because the root filling has been well done. But the tooth has failed, due to the crack in the root. Sometimes a patient will come to my office with a failing root canal that they had done elsewhere, and ask me if a failed root canal is dental malpractice. The answer is "no, not necessarily". As you can see, root canal treatments are very complex, and there is potentially a lot that can go wrong. I have rarely seen a failing root canal that I could directly say was due to malpractice. If you think you have a root canal that was not done properly, you really need to get a second opinion from an endodontist. Research shows that root canal failure is relatively rare. Most root canals have a success rate of over 90%. You are more likely to get a failed root canal in a back tooth than a front tooth, but it is still the best option in most cases, over getting the tooth pulled. That leaves you with a gap, or expensive bridgework or implants!